A closed flower is the perfect spot… a place to sleep, nectar to drink, pollen to enjoy… what could be better for a bee? On March 1, the end of a nice sunny week filled with bees in crocuses, I saw a very large bumble bee slowly hauling itself from one crocus to another, clearly slowing down as the light faded and the chill in the air became more noticeable. After some half-hour of labored clambering, she settled in one particularly large, sturdy looking crocus. As night drew closer, and the crocuses began to close, this bumble bee stayed within its flower as other bees, among them mining and honey bees, flew off home. By evening, all I could see was one beady, multi-faceted eye staring up out at me from the small hole in the flower where the petals meet when closed. The next day brought rain, and lots of it. In fact, it continued to rain each day until March 4, and each morning and evening when I checked, there was still a beady eye to greet mine peering in (or at times a fuzzy bum!) March 4 brought a bit of sun, but was still in the low 50s. The crocuses did open slightly, but the bumble bee never left its flower, just remaining huddled, cold inside. 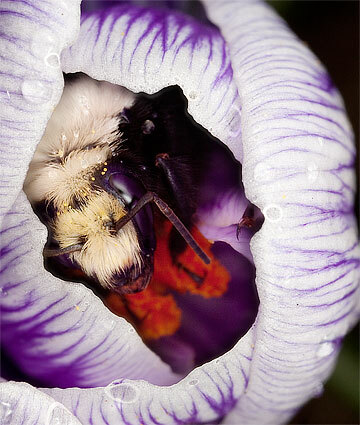 March 5 brought similar weather, but slightly warmer, and the bumble bee bumbled actively on her crocus, still showing no signs of leaving, instead having the odd sip of nectar, dangling off the petals, then clambering back into the flower’s center again. As the crocuses began to close in the evening, the bumble bee waited for her crocus to close… but the day’s bumbling had taken its toll on one of the petals, which was bent towards the ground. Knowing it would rain in the night, I gently nudged the petal back into shape, so that it could protect the bumble bee happily for one more night :) The next day, after a cold night of rain, the sun came out and the bumble bee buzzed off in search of fairer crocuses across the patch… after spending 5 nights in one crocus! 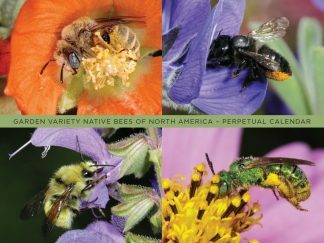 So many people come by this page, curious about if and where bees sleep at night! Thank you for reading :) I thought I’d add a link to something interesting I read last year about honey bees sleeping: Bees learn while they sleep, and that means they might dream. Recent studies indicate honey bees experience a deep sleep state that helps them retain memories and learn new things. Honey bees sleep between 6-8 hours each night, and even hold each other’s legs as they snooze! I have a bumble bee friend who sleeps each night in a large leek flower just outside the back door – I feel privileged to have such a happy little friend. We keep several birdbaths full of pebbles and fresh water all spring and summer in the garden. When it is hot the bees carry water back to the hive to cool it. Our garden has turned into a bee hangout. That’s great! I do that too, and have quite the bee hangout at my place :) People often don’t realize that bees need water as well. On savebees.org I encourage people to put out a shallow dish of water with pebbles in it (especially on hot days) to help bees and other flying critters. That is the coolest story! I always wondered where they went at night. And you helped it by arranging the flower. That is something I would do. I always save them from the pool, and sometimes get stung, which kills the bee, but as they say, “no good deed goes unpunished.” I’ll keep trying, and thanks for the information. It’s great to hear of someone else saving our buzzy little friends :) You might try rescuing bees in the pool with a leaf rather than your hands, as it’s less likely they’ll lose their sting to a leaf and they’ll be more likely to live!